Arwenna Stardust was first rezzed on Nov 4th 2006 when Clare Atkins first ventured down the slippery slope that is the pathway to a second and virtual life. During that time she has changed her physical appearance,gradually becoming more sophisticated in dress and hairstyle as her budget got bigger! One constant has remained though – whether dancing, building, teaching, or exploring, she almost never wears shoes! These two photos are Arwenna as she usually appears now but below are some that chart her development over the past year. As far as I know this was the very first photo of Arwenna taken in early November 2006 in the wonderful gardens at Innisfree. Very close to the original ‘girl next door’ standard avatar, Arwenna has started to personalise her appearance with accentuated cheekbones, the longest hair that the Appearance tool will provide, a newly-made purple jacket and, of course, wings! I have become convinced that almost all people new to the online games wear wings for at least a short while when they first enter Second Life. I think Arwenna wore them for around two months before the novelty wore off! In fact, it was a comment about her wings that first alerted me to the close bond that was developing between Arwenna and I. In her early explorations, Arwenna visited an educational sandbox and stood watching amazed as someone built a space helmet. When asked to model the helmet so that it could be adjusted she readily complied and tried desperately to stand still while adjustments were being made. After a frustrating 10 minutes or so, the builder said: “Take your wings off – they’re getting in the way. Arwenna was mortified and for just a second or two, I was thinking ‘How DARE he!’, until common sense intervened and the wings were removed. I was chuckling to myself but also just a trifle alarmed at how quickly the defensive shackles had risen in response to such an innocuous and sensible comment. On reflection it felt as though someone had asked me, in real life, to cut my hair or shave off my eyebrows – in other words to interfere with something that was an integral part of me and that couldn’t be removed without a loss of selfhood or at least dignity. Looking again at this photo I realise it is probably the only photo of Arwenna wearing shoes – she ditched them soon after this and having been totally unimpressed with all that she has seen, has never worn a pair since….! In all other respects though (discounting the wings of course!) Arwenna’s clothes are not that far removed from what I might wear in RL, jeans, t shirt and jacket – mmm not very adventurous in terms of fashion then! The next photo is from the end of this early era and is beginning to illustrate an early understanding of how to personalise an avatar. Still in freebie jeans but with a newly bought top, Arwenna is still attached to her wings but gradually changing facial characteristics and with a somewhat crude but slightly improved skin. Arwenna occasionally takes on different forms – for no other reason than she can! A mermaid is a particular favourite as is a monarch butterfly. However neither of these forms are very practical for many of Arwenna’s usual activities. Hello, You might be interested in the Hong Kong Net cooperative business education in Second Life. It’s a joint program of three universities, eighty graduate level students from three universities, working together in a coordinated program in ten teams of eight students. Contact me for further info. 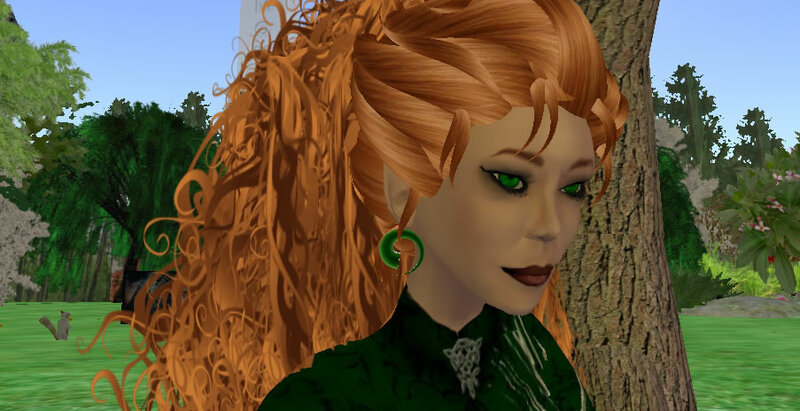 Second Life: Avatar: TonyEMS Heying; Sim: MeetingSupport; Location: Alpine Executive Center.